A public-private partnership, the USRAP is the world´s largest formal refugee resettlement program. Together with Australia and Canada it receives 90% of the refugees referred by the United Nations High Commissioner for Refugees (UNHCR). Until recently, it had been a model for other countries interested in becoming active in resettlement. For fiscal year 2018, U. S. resettlement agencies are anticipating the lowest number of refugee admissions in the program´s history, given that as of August 31, 2018 only 19,899 refugeeshave arrived (of a maximum set capacity determined by the President at 45,000). For comparison, since 1980, the United States has resettled as many as 207,116 refugees per year (in 1980, mostly Vietnamese and Cambodian refugees) and as few as 27,131(in 2002, due to a temporary slow-down of the program post- September 11). While this was just beginning across the Atlantic, the United States had already been dealing with its own refugee crisis due to a surge of arrivals of immigrants in need of humanitarian protection during 2014. Thousands of unaccompanied minors from El Salvador, Honduras and Guatemala arrived in the U.S., collapsing an already backed-up asylum system. Since then, more than 130,000unaccompanied minors have arrived to the United States. And more continue to arrive to date. California has had the largest influx of unaccompanied minors seeking asylum from the Northern Triangle, who were escaping violence in Honduras, El Salvador and Guatemala. From October 2014 to September 2017, more than 18,000 migrant children that arrived to the United States without a parent were connected with their families in California. The U.S. refugee crisis did not make the global news for as long as the Mediterranean crisis did, but it received plenty of attention by the service community in Los Angeles. In the United States, unaccompanied undocumented minors are placed in special homes for short-term care under the custody of the Office of Refugee Resettlement. The most urgent need of the children, after being reunified with their family members in the United States, is securing legal representation to obtain relief from deportation, which is a sometimes long and complex process. This explains why the initial response to the crisis of Central American refugees in 2014 came from the legal service community (NGOs) which activated networks like the Asylum Collaborative of Los Angeles and convened service providers, local governments, school districts and community-based organizations to provide community education to parents and custodians in the city and to find ways to assist and protect the children from deportation. The Mayor’s Office of Immigrant Affairs, under the leadership of Dr. Linda Lopez, involved local foundations to support and expand the work on behalf of these children and ensured there were enough shelters in the Los Angeles area while they were reunified with family members. From these collaborations, many new networks developed, such as the Unaccompanied Undocumented Minors network that includes legal and social service providers in addition to other initiatives from faith-based groups, such as the UCARE (Unaccompanied Central American Refugee Empowerment) Coalition, that have been able to provide more assistance to the refugee children beyond the legal services, that have helped them heal and integrate into their new communities. Dealing with this crisis allowed many of us to connect as a community and showed us the support for social justice initiatives in our city. While it has been four years since the crisis began, there are different sets of challenges now that require our attention, such as family reintegration, avoiding school dropout and accessing employment without sacrificing higher education. During 2015, Germany received over 1 million people seeking protection (asylum seekers)from Syria, Iraq, Afghanistan and other war-torn countries. Upon the arrival and registration, asylum seekers would be distributed to different Länder(state) and assigned housing accordingly. Once settled, they would start the application process and their cases would be evaluated under the different forms of relief. This burden-sharing system and the availability of services for asylum seekers are both very different from the United States, where asylum seekers that are out of detention centers do not have access to public benefits or public housing. In Germany, between 2015 and 2016, hundreds of citizen-led initiatives appeared on the map, as the volunteerism movement in the country experienced a historic peak. Retired teachers, private sector professionals, heads of households and students: everybody wanted to give them shelter and assist in the response. However, with time, it became more challenging to keep volunteers engaged into integration efforts and not just limited to in-kind donations. Some local governments addressed this issue with the creation of “Welcome Points” that were of help not just to the new arrivals but also to members of the receiving communities interested in assisting. A number of events and incidents of crime and the respective media coverage (or lack thereof) at the end of 2016 created tensions in the receiving communities and the perception of refugees and asylum seekers changed significantly. Considering the varied demographics of the arrival population and their odyssey to get to Germany, there was no one-size-fits-allpreferred type of assistance. A holistic approach was needed to tend to the multiple necessities of the displaced. Housing, feeding and distributing the new arrivals throughout Germany using the already mentioned distribution quota (Königsteiner Schlüssel)were the primary concerns. However, a long-term plan and new ideas were crucial to assist in the process of integration of these new arrivals to Germany. The Welcoming Communities Transatlantic Exchange (WCTE) program was conceived in 2015 to create a support network for German integration practitioners. At that time, given the reputation and dynamism of the United States’ immigrant integration landscape, they looked across the Atlantic for guidance to develop new initiatives and to envision the long-term impact of those arrivals. Yearly since 2016, this exchange program has allowed 25 professionals from five German communities to travel to the United States and 16 professionals from four U.S. communities travel to Germany. In 2017, Los Angeles was selected as one of the U.S. communities to participate in the exchange. By the end of the program in 2018, 27 communities will have benefited from this exchange. Organized and administered by Cultural Vistas, Welcoming America and the Heinrich Böll Stiftung North America, this program is funded by the Transatlantic Program of the Government of the Federal Republic of Germany’s Ministry of Economics and Energy (BMWi) as well as by the U.S. Department of State, the Robert Bosch Stiftung, the Heinrich Böll Stiftung and BMW Group. Its aim is to create welcoming communities by sharing and learning best practices and challenges experienced in welcoming immigrants and refugees in both countries. The political environment and tensions around the topic of immigration have changed significantly in both countries since the inception of the program which needs to focus on integration and self-reliance of new arrivals and the impact of such groups in the receiving communities, their economies and cultures. In comparison to Germany, U.S. numbers for 2015 (approximately 70,000 formally accepted refugees, 26,000 asyleesand 120,000 asylum seekers) sound much lower than the 1 million arrivals that Germany received. We should take into account, however, that the U.S. does not receive spontaneous arrivals due to its own border controls and Mexico’s, whose government between 2014 and 2016 detained and deported more than 450,000 migrantsthrough its Southern Border Program. Additionally, those that manage to enter the United States without a visa, are not registered until they request a form of protection, so the U.S. numbers could be much higher if these factors were considered. Throughout 2016, a group of colleagues and I had been reading and hearing about the German response to the refugee crisis, and learned about this exchange opportunity through Welcoming America, which we thought would be invaluable as we looked for innovative solutions to our ongoing refugee crisis. We thought that sitting down with our German counterparts and discussing long-term strategies for assisting unaccompanied refugee minors and other new arrivals would be a good way to think outside the box. We also thought that some of our lessons learned should be shared with them. Our team included Nicole Mitchell, from the Los Angeles Unified School District (LAUSD); Dr. Linda Lopez, from the Mayor’s Office of Immigrant Affairs; Reverend David Farley, from Clergy and Laity United for Economic Justice (CLUE); and me, representing the Legal Aid Foundation of Los Angeles (LAFLA) and the Refugee Forum of Los Angeles. Our proposal was selected to participate in the 2017 Welcoming Communities Transatlantic Exchange program together with Nashville, Detroit and Salt Lake City. As part of this exchange, we would receive the five selected German communities from the cities of Düsseldorf, Freiburg, Kreis Duren, Leipzig and Münster and later in the year travel to Germany to continue the exercise. Twenty-five German immigrant integration professionals came to the United States between April and May 2017, a mix of state and civil society actors including elected officials, local government employees, volunteers and NGO practitioners. They visited Washington DC together and were later split in three smaller groups that traveled to Detroit, Nashville and Salt Lake City, respectively. All five communities concluded their tour in Los Angeles, where “Team L.A.” had prepared a packed agenda around two topics: Los Angeles as a Welcoming City, and how we have been responding to the Unaccompanied Refugee Minors Crisis since 2014. From May 5thto May 9ththey met with different stakeholders from the public and private sectors involved in immigrant and refugee welcome. The program started with a visit to a Welcome Center that serves the unaccompanied minors and their family members upon reunification. We started by talking about the lack of government-sponsored legal representation for immigrants in proceedings –including children– which, together with the fact that children can be put in deportation proceedings, was quite shocking for our guests. During that visit, they learned of all different actors involved in the journey upon entry to the United States and how we were able to create a coordinated response. On the following days, the participants heard about services for immigrants through the Citizenship Corners (recently rebranded “New American Centers”) at the Los Angeles Public Library; they visited City Hall and learned about the Mayor’s Office of Immigrant Affairs, the creation of the Los Angeles Justice Fund and the role of the Los Angeles Police Department protecting immigrants and its historic Special Order 40. Additionally, participants had a chance to visit the largest Mexican Consulate General in the world, where they were impressed by the numerous services offered to the approximately 1 million citizens who are part of the Mexican diaspora residing in the city as well as the diplomatic efforts to build relationships between the State of California and Mexico. Another important meeting during their visit was with resettlement agencies and other members of the Refugee Forum of Los Angeles, where they exchanged ideas around some of their innovative projects to provide psycho-social support for refugee minors. The L.A. program concluded with a panel led by USC Professor Manuel Pastor, who wrapped up the learning experience with a discussion on the city’s landscape and evolution and its leadership in immigrant integration. Here, the German delegates met leaders of two major local foundations (Weingart Foundation and California Community Foundation) who contributed substantially to the creation of the L.A. Justice Fund, which has distributed 10 million dollars to local non-profit agencies to represent immigrants in removal proceedings- and who were also instrumental in the creation of the Our Children Relief Fundin 2014whichfunded operations of non-profit agencies in Los Angeles County that were providing immigrant integration supported services to unaccompanied minors. This was an enriching experience for both the German and the American teams, where we built bridges, discovered our commonalities, created new bonds and strengthened existing ones that would allow us to do our work with a fresh perspective. We felt empowered after showing them the Los Angeles we know: a caring and compassionate community full of citizen diplomats that will stand for the immigrants, the refugees and the voiceless. LaLa Landis so much more than what they had expected and seeing our city through their eyes, gave us great satisfaction to continue our fight. Orders were issued imposing three different travel bans for immigrants from Muslim majority countries and numerous lawsuits were filed to challenge the bans while hundreds of protests across the country became the norm. The community went through unbearable uncertainty but at a local and state levels, our partnerships strengthened and our institutions responded with bold alternatives and funding for programs that would ultimately allow the protection of those immigrants already here, their families and our communities. Just one week after our German colleagues left Los Angeles in May 2017, I went on maternity leave and embarked in a whole new journey. 2017 was indeed a hard year, but in spite all those difficulties, the two things that I will remember the most are the birth of my daughter Olivia and participating in this exchange. Fortunately, in November of 2017 I got to combine both of them, as Team L.A. traveled to Germany with a five-month old baby, ready to learn about immigrant and refugee integration practices. Our teams learned about the way Germany received and welcomed asylum seekers and were impressed with the availability of services for immigrants in need of humanitarian protection whilst their cases were yet to be decided. The themes covered during the exchange were: the German Federal system and the asylum process; refugee housing; integration response; policies and procedures at local, Federal and E.U. levels; empowerment of refugees and immigrants; civic participation for migrants; workplace integration (vocational training) and the role of charities. We started the German tour in Düsseldorf where we met with all the selected U.S. teams from Detroit, Nashville and Salt Lake City and our German colleagues. This was our introduction to the German refugee resettlement system, at the capital of North Rhine-Westphalia (NRW), the most populated state in Germany. We met with NGO staff, volunteers, refugees and local and regional civic officials (including the new Commissioner for Refugees, the Mayor of Düsseldorf and the Head of Home Affairs at the State Chancellery for the NRW to the European Union). The diversity of stakeholders involved in the process was eye-opening, and the type of services they aimed at providing was inspiring. Access to housing was one of the services that differ considerably from our services in the United States, especially when talking about asylum seekers. While their cases are still to be decided (which most likely takes three to four years), asylum seekers in the U.S. do not have access to temporary housing or public benefits. This is a big challenge in a city as expensive as Los Angeles, and seeing that Germany had given priority to this service to new arrivals, was mesmerizing. From Düsseldorf, some of us traveled to Freiburg, in the Southwest of Germany, at the borders with both Switzerland and France. By meeting with different stakeholders, we had started to understand the distribution of responsibilities among them: the Federal government dealt with initial registration and distribution; the States/Länder dealt with housing; counties and urban districts had to do with their preliminary accommodations and municipalities with subsequent accommodations and, ultimately, the individual would be responsible for their permanent housing. In the case of Freiburg they provide public housing for 3,000 people and 55% of them are asylum seekers. We visited the Office of Migration and Integration (Abteilung für Migration und Integration, AMI for its acronym in German), where we witnessed a great model of service provision and highlight of the exchange: a one-stop shop for asylum seekers, whose five different departments could help with integration, housing, benefits and immigration/legal services. Also in Freiburg, we met with colleagues from Caritas that are providing legal and social services to unaccompanied refugee minors, which has been one of our focuses in Los Angeles since 2014. They shared that in 2015, the Federal government responded with funding to support specialized integration services, which allowed their teams to grow and specialize. Also, it was reaffirming to hear that they, too, were paying attention to staff and volunteer wellness, to ensure the sustainability of the sector. While in Southern California (and through the United States) we see multiple nationalities seeking asylum according to political changes around the world and the diasporas, we learned that in Germany five countries are given preference at the time of getting refugee status: Iraq, Iran, Somalia, Eritrea and Syria. This can make it more difficult for those coming from North and Sub-Saharan Africa, who might have valid claims of persecution and are also seeking humanitarian protection. An area that was very different between Germany and the United States was language acquisition and integration. In the U.S., the main focus for integration is obtaining employment, regardless of the refugee´s limited English proficiency. This may be connected with the fact that refugees with limited English proficiency can still get a job in the United States (which is very understandable in cities with large immigrant populations like Los Angeles). Differently, in Germany, while labor market integration is their paramount objective, the integration path for immigrants requires learning the German language first. The other integration area that differs from the U.S. is citizenship. Having worked in the immigrant integration field for almost 15 years, I can attest that the final goal and the ultimate protection for humanitarian immigrants is citizenship. Allowing them to have a new nationality, the one of the country that received and protected them, fills refugees with pride and honor. It will also open additional doors to them, as U.S. citizens can vote, run for office, work for the Federal Government and petition for additional family members. So naturalizing to become a United States citizen is the ultimate goal. From my point of view, in Germany that did not seem to be a priority yet. While Germany has a long-standing tradition of being an immigration country and while availability of services to immigrants is quite comprehensive, with this latest wave of humanitarian immigrants that started in 2015 the focus still seems to be on meeting immediate needs and not on long-term strategies such as citizenship and political participation. However, I have no doubt that as the new groups adjust and contribute to German society and as the perception of them as just vulnerable immigrants, integration priorities will continue to evolve and more weight will be given to these groups becoming German citizens. At the conclusion of our visit to Germany, U.S. teams designed and committed to action plans for each of their cities, inspired by what we witnessed. In Los Angeles, for the past five months, we have been actively working to make the city more welcoming by connecting more with the receiving community. We returned to Los Angeles energized with vibrant ideas and with new partners whom we expect to continue building vibrant and resilient communities with. At a key moment for the relationship between the United States Government and the German Federal Government, thistype of exchanges at a citizen level, bring a breeze of fresh air and help build bridges for transatlantic collaboration on a topic where a mutual exchange can provide solutions to some of our common problems around immigrant integration. After three years of exchanges, Cultural Vistas, Welcoming America and Heinrich Böll Foundation will conclude the WCTE in November 2018 with a conference organized and led by alumni of the program. The presentations will combine U.S. and German team members under the theme “The Future of Welcoming Communities” and will take place in Berlin. Although the refugee rights sector has been experiencing challenging times, the WCTE program has been able to revitalize the efforts of these refugee integration practitioners in both countries in the hope that its impact will continue well into the future and that newcomers in need of humanitarian protection receive the support they need to start new lives and become integral part of their new communities. Department of Homeland Security, Office of Immigration Statistics Annual Flow Report: http://www.dhs.gov/immigration-statistics. On International Day of the Child, UNHCR released the short film “La Piragua” in collaboration with the National System of Youth and Children’s Orchestras (El Sistema)that comes to remind us of the many children that are affected by violence and conflict and that solidarity has no borders. While the video narrates the story of a Colombian family that is forced to flee to Venezuela, it made me think of how many Venezuelan children and families have left their motherland and will never grow up there due to the difficult situation in the country. Venezuela is a refugee hosting country (more than 200,000 refugees to date) while at the same time, it has produced one of the top of nationalities seeking asylum in the US (#4 in 2012). Today, when in the US we’re hoping to hear President Obama talk about how he’ll fix the immigration system to help the thousands of unaccompanied minors that have been seeking refuge here, let’s find perspective and try to walk on their shoes whether they are from Syria, Honduras, Congo, Colombia or Venezuela. I hope to see the day when they don’t have to worry about these things and when we don’t have to fight for their rights. As Mafalda would say…. 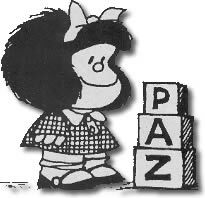 PAZ !!!! 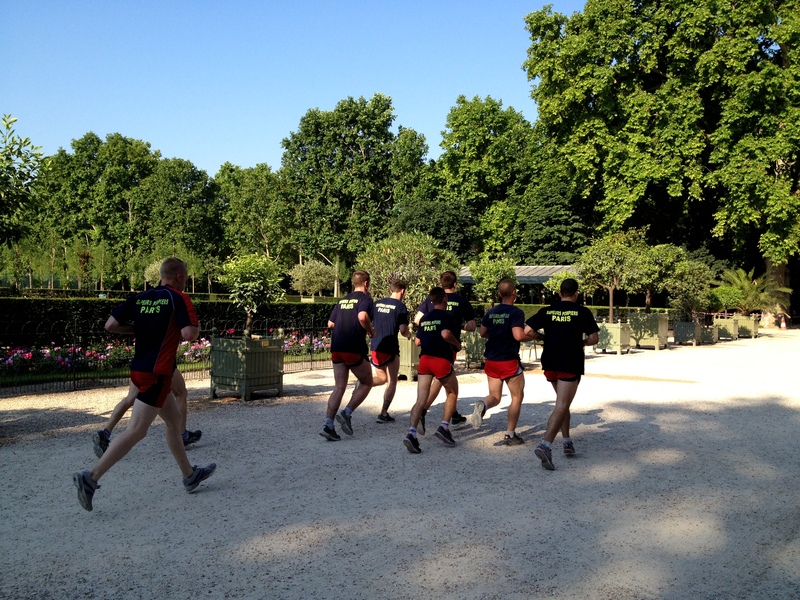 Last week was one of many achievements, personal and professional. First, I logged my first official 1,000 miles on MapMyRun -the result of 19 months of using this program. Shyly, since November 2012, I have only ran two half-marathons and several 5Ks. 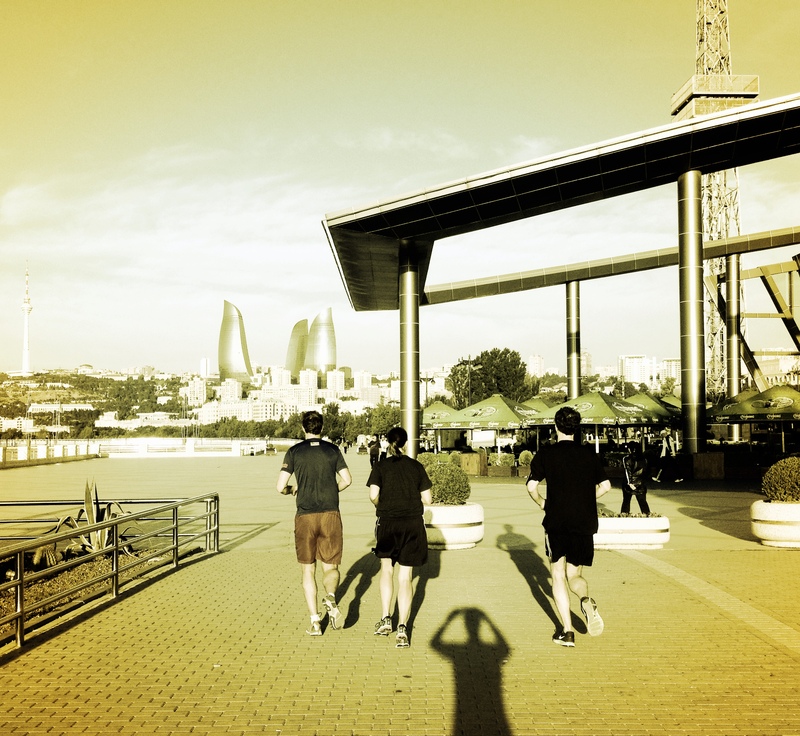 However, I feel proud to say that during this time I was able to run in six countries and more than 13 cities (including the not so runner-friendly Baku and Phnom Pehn), always in great company. 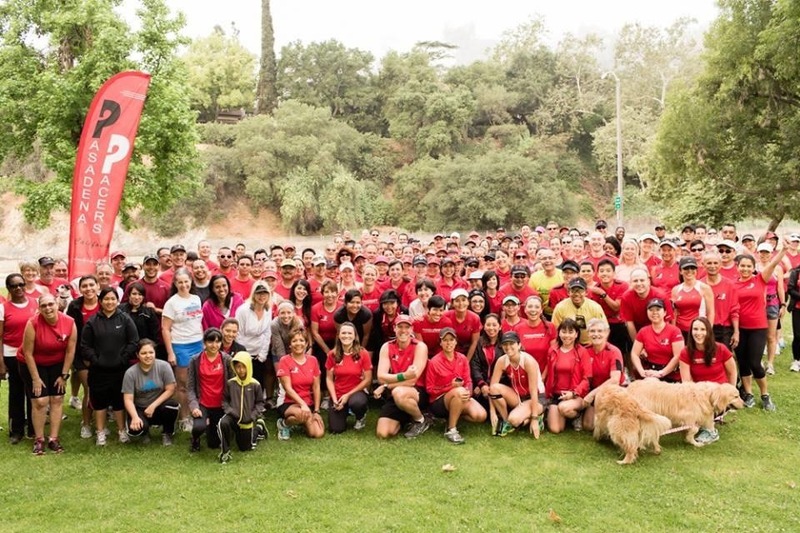 It has been phenomenal and I could not have done this without my Pasadena Pacers. To my coaches, friends and idols, to all of you that have surrounded me these past years and encouraged me to be stronger, faster and more disciplined: THANK YOU! On the professional side, I marked my 10 year anniversary at work. This job has allowed me to grow immensely and to do incredible life-changing work where I can see the result of my efforts. There, I have had the privilege of serving refugees, asylees and their families while working side-by-side and learning from expert advocates in this field. First as a human rights analyst and most recently as a project coordinator I have been able to develop and nurture a program that through the provision of legal services, makes immigrant integration a priority. Having faced integration challenges as an immigrant myself, I see now how determinant that job interview was 11 years ago. Thanks to my clients, for inspiring me to be a better advocate and for teaching me so much. Infinite thanks to my mentors and my team, for allowing me to take our Project above and beyond. I imagine these random mindful reflections might not be the most interesting chapters of my blog, but I wanted to share these tiny victories today* because it’s June 8th. And for me, it is a time to remember. 17 years ago, also a Sunday, I started dating Freddy. He has been the constant in my life and has helped me set my compass in the right direction and encouraged me to pursuit my dreams. I could not ask for a better partner for this mission. 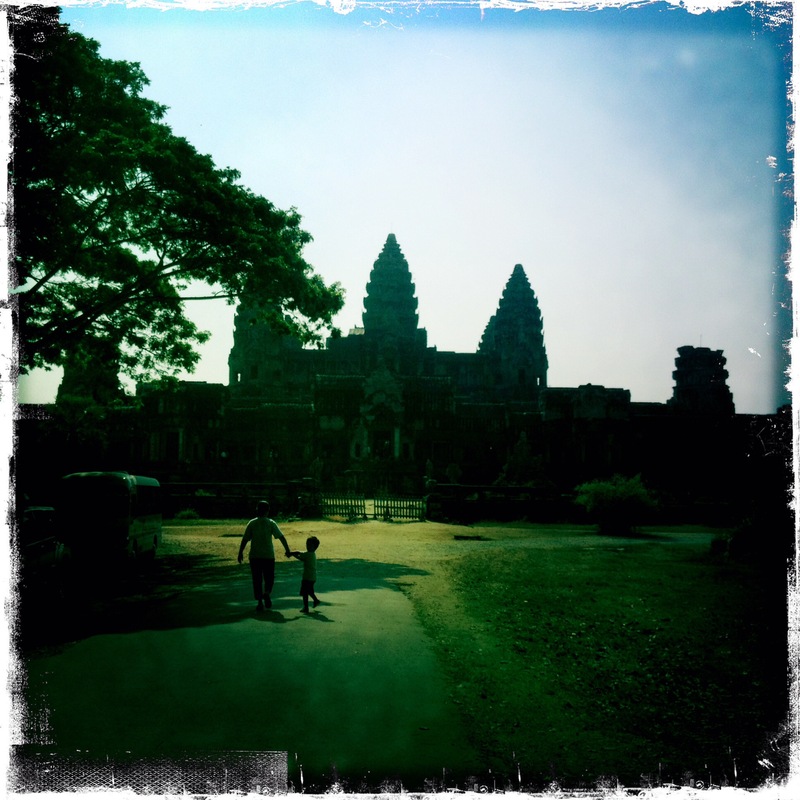 On my last entry (“Enough?”), I shared with you some reflections on our Cambodia field study. Since then, lots have happened leading to the closing of the Rotary World Peace Fellowship. And just like that, three months went by. 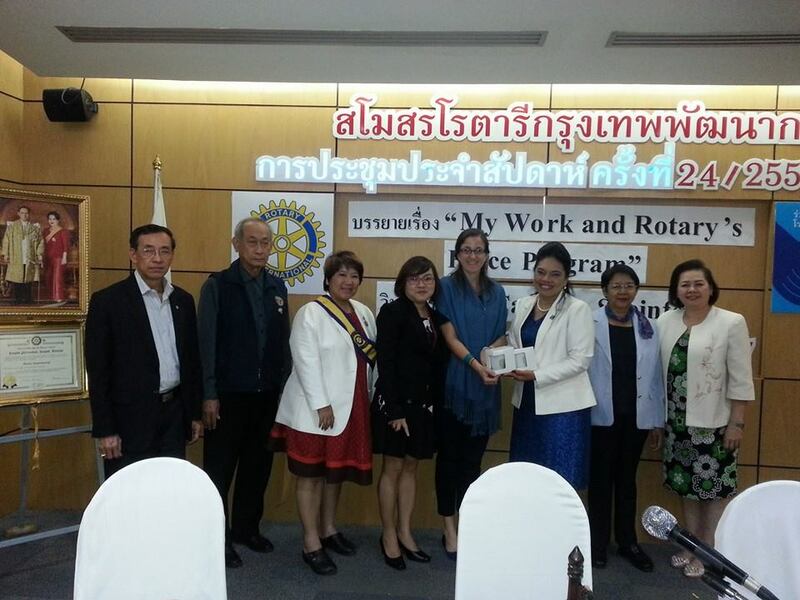 Sawadee ka to the Rotary Fellows, to the Peace Center, to Chula, to our host counselors, to CU House, Sky Train, Siam and so many more of my Bangkok companions. Thank you all for a wonderful, life changing experience! 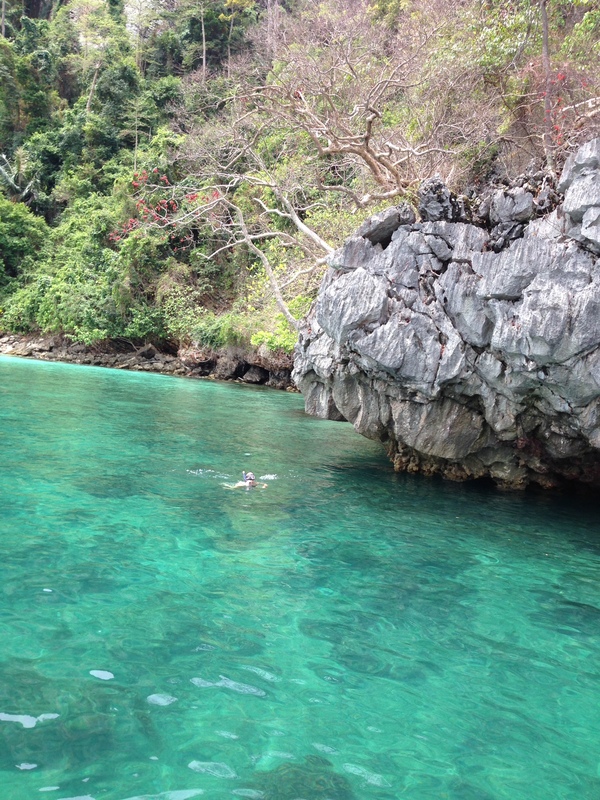 And for the last Thailand Diaries post, I could not leave out the mandatory snorkeling picture, so during the last week in Thailand I got to explore part of the Southern beaches in very good company, as Freddy came to the rescue and helped me on the pilgrimage back to the US. Today I am writing from the city of angels, almost two months since landing. I had anticipated the reintegration process to be challenging, especially the traffic situation here and having to drive to and from work every day. It has been something else. Above all, I feel blessed to have had this opportunity of seeing a new continent, meeting new people and living in a foreign country while learning something new every day. I have returned to my old routines, flavors and dynamics. I have met with friends, celebrated life and exchanged stories. I am ready for the next challenge! I have to admit that arriving to Phnom Penh felt a bit like traveling back in time. 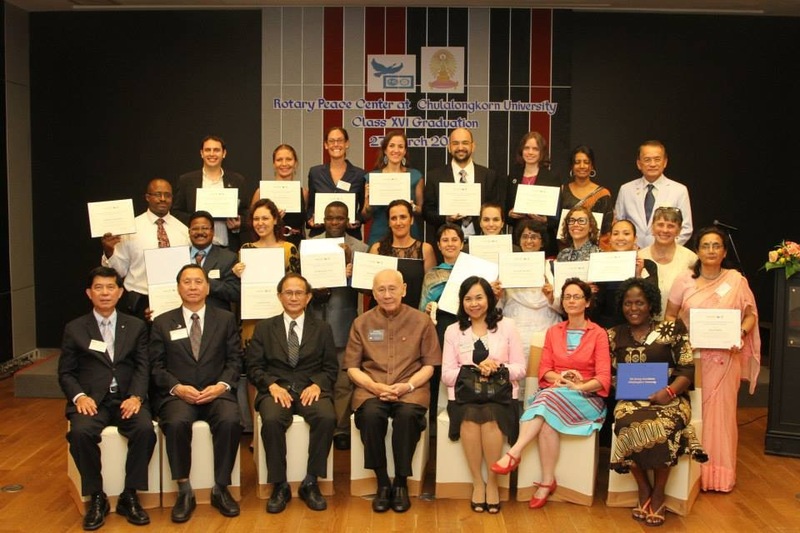 While this international field study of the Rotary Peace fellowship was designed with the idea of studying the post-war reconstruction and peacebuilding of a country, Cambodia is still in the process of recovering from tremendous damage of decades of wars and foreign interventions. Almost twenty-one years ago they had their first free and transparent elections -under the supervision of the United Nations- and since then, some progress has been achieved but there’s still a lot to be done. Our field study included more than 10 organizational meetings with different Non Governmental Organizations (NGOs) in three different cities (Phnom Penh, Pursat and Siem Reap); additionally we had several field visits to some of their projects, which was very inspiring. 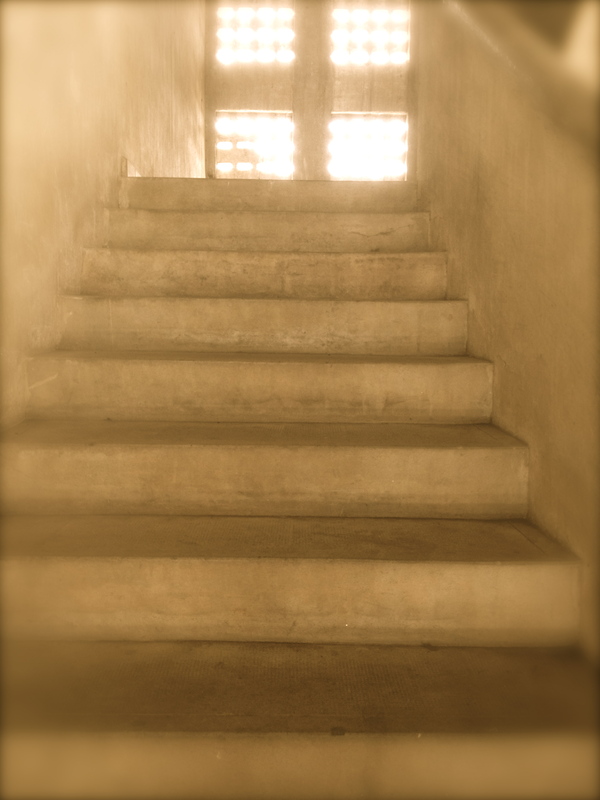 One thing that impacted me deeply, early on our field trip was the visit to the Choeung Ek Genocide Memorial (“Killing Fields”) and the Tuol Sleng Genocide Museum (“S-21”) -a school-turned-prison during the time of Democratic Kampuchea. Not just because of the thick air that we breathed while there; and the thousands of unidentified skulls that we saw on display in a seventeen-story ivory tower; but because it’s hard to see the inhumane conditions in which those men, women and children were held in and the types of torture that they were subject to before leaving this world. Before coming to Cambodia, I had listened to hundreds of stories of torture from my survivor clients (from Cambodia and many other countries where torture is or was practiced like Cameroon, Eritrea or Sudan -to name a few) but being there, walking the same grounds where tens of thousands were held inhumanely, was a very painful experience. I will not forget. The big question that I’m taking with me after visiting Cambodia is how can we foster forgiveness and peace without forgetting that these violations of human rights and violent behaviors are still being repeated in our times. We’ve seen it happen in Rwanda; in Bosnia; in Democratic Republic of Congo; Syria and most recently in Central African Republic. In all these, one group has tried to erase diversity of thought, expression and opinion of another group. Sadly, many countries today are still experiencing some of these same attitudes -both in peace and in conflict- but why do other countries stay silent knowing what could happen? For most of us visiting Cambodia for the first time, deciphering the events and motifs of the Khmer Rouge era was at the center of the discussions in almost every single one of the visits and conversations with local NGO staff and even with our guides who were so kind to share more of their personal stories with us. However, those three years, eight months and twenty days were such a horrific time that I can understand why Cambodians would prefer to forget and not talk about what happened. The fact that only foreigners were visiting these memorials could be an indicator of how Cambodians would rather delete this from their memory, even when they were meant to acknowledge this dark time of their history and help them rebuild their country. Today, Cambodians are tired of this “victim” label. Has their government tried to move away from it? It’s enough. But does the Government agree with its people or are they just interested in getting more charity-tourism and reconstruction funds from foreign governments and hundreds of NGOs? Cambodians are trying to tell a different story. This is a young country -77% of the population is under the age of 40- which means that most of them were young children during the Khmer Rouge era. Their lives have been marked by the deaths of family members, friends and neighbors. Many continue to search for answers. At the same time, they also want to move away from those painful memories and look forward to a better and brighter future. We were told that this could be connected to Buddhism, as for them focusing on the present and the future is more important than getting stuck in the past. 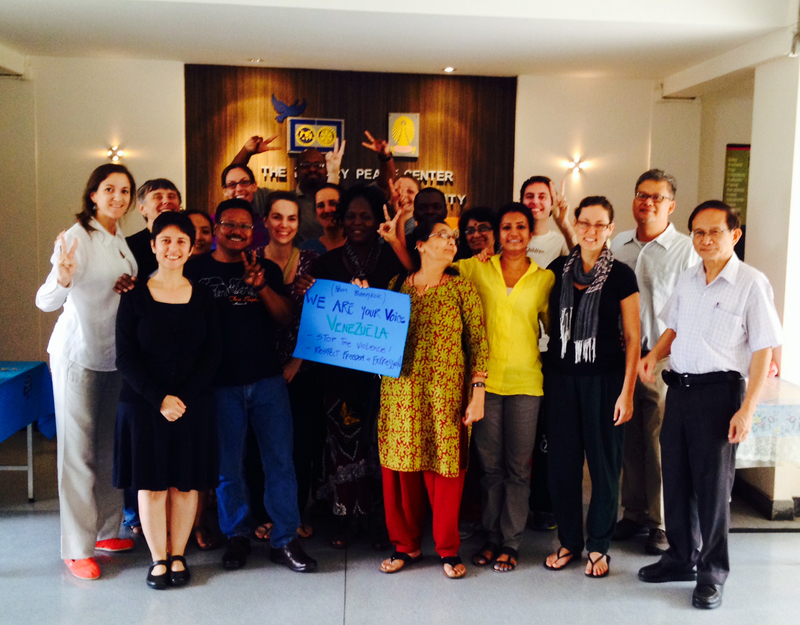 How is civil society contributing to change the image of Cambodia? Are they trying to rebrand their country to attract investment, more tourism and/or to improve relations with other states? And who composes civil society in Cambodia? Is it limited to Cambodian citizens and private companies or are the over five hundred NGOs with a combination of foreign and local staff also included here? From what I saw, NGOs have come to fill in the gaps on areas that the government is not paying attention. Agencies like Friends International, are fostering youth integration and showing a new face -and a different flavor- of Cambodia through their cooking academy, various restaurants and distinctive menus. Cambodian diaspora that has returned to the country has also put a lot of effort into changing those negative perceptions, especially through the arts. Examples are fashion designer Romyda Keth; movies like ‘The Missing Picture’, nominated for Best Foreign Language Film at the 2014 Oscars, and documentaries like ‘A River Changes Course’, winner of the Grand Jury Prize for Best Documentary at Sundance Film Festival, are products of the explosion of creativity and culture that has emerged in the post-war era of Cambodia. Nevertheless, there’s not enough being done by domestic or international actors to use arts in their favor. Thirty-five years after the fall of the Communist Party of Kampuchea (CPK or Khmer Rouge), I could feel the leftover effects of all the lies and confusion infused on the population by the CPK and the atrocities of the Cambodian Genocide. But I tried looking further and listened carefully and I found the strength that comes from the pain that this country has suffered: their resilience. On February 12, university students in the Western city of San Cristóbal, tired of violence, high inflation and lack of basic necessities, marched demanding change from the Government. Seven of them were arrested. Days later, opposition leader Leopoldo López called for a big rally in Caracas, and thousands occupied the streets, dressed in white and raised their tricolor flags, full of optimism that their voices would be heard and that those students would be freed. Some used the opportunity to express their frustrations with the current government, complained about corruption, scarcity and inflation, and many marched because their friends asked them to. The messages from the opposition’s side read: “Free the students”; “Stop the violence”; “The only way is out” (“#lasalida”) and “he who gives up loses” (“#elquesecansaPierde”). The Government too, called State employees for a rally to show their support to the President. They wore red shirts with the emblem of the Venezuelan Oil Company (PDVSA) and a tagline from Ché Guevara’s speech in Havana in 1969: “(…)Being apolitical is to give your back to all the movements of the world(…)”. As people were wrapping up for the day, three armed thugs from paramilitary groups (“Colectivos”) started shooting at the opposition supporters, injuring dozens and killing two people. This created unrest and since, more people have taken the streets around the country demanding change. More restrictive measures were put in place: security forces diffuse protesters using excessive force with water cannons, tear gas and rubber bullets, and armed thugs are shooting at unarmed civilians. Scared of all this, they have improvised barricades with debris (“guarimbas”). To add more to the picture, the government is in control of all communications and has revoked the credentials of various foreign journalists, as well as taken off the air one TV station for being too supportive of the opposition. Freedom of speech is not being respected and to date more than a dozen deaths have resulted from this chaos. Meanwhile, the opposition continues to support peaceful and sustained protests and the messages have shifted to #sosVenezuela, #PrayforVenezuela, #IamYourVoice and “Say No to Repression and Violence”. In spite of other violent events happening in Syria, Central African Republic, Ukraine and Thailand, foreign media has started to pay attention. Twenty-five years ago, on February 27, Caracas was immersed in riots, looting, shootings and nonsense violence between security forces and protesters in what was called the “Caracazo”, a bloody stain in that country’s history. I still have a vivid image of what I saw on Spanish television at the time: a warzone with looters carrying refrigerators and police shooting at civilians. Today, I’m scared to see violence escalate again for very similar reasons: citizens protesting against the government, tired of its corruption and security forces using force against them. Not until 1999, the country was taken to the Inter-American Court for Human Rights and was found guilty of all the charges surrounding the arbitrary suspension of various freedoms; the deaths of 276 people and the disappearance of many. To date, no national court has heard these cases. Has there been reconciliation from these events of a quarter century ago? Did the investigations reveal the perpetrators of these crimes and are they still part of the security forces? How do the Venezuelan people feel about this dark past? There are too many questions that remain unanswered, and too many perpetrators that remain unpunished, so I wonder if the country really healed those wounds, and if this is the underlying reason for so much discontent between factions in Venezuelan society. Today, president Nicolás Maduro calls the opposition fascists and accuses them of being the cause of the country’s problems. At the same time, he likes to talk about peace and has convened a National Peace Conference, creating two national commissions: one on economic truth and another one on reconciliation, which will include representatives of different sectors of Venezuela’s society. Is President Maduro and his government open to reconciliation with the other, and is he willing to take a step back from his aggressive tactics? Will all the voices be heard? I fear that this effort will fail and that it’s too early for this type of transitional justice mechanisms to be put in place. Unfortunatelt, this calling for peace is no more than a rhetoric campaign in an attempt to rebrand his international image and that of the United Socialist Party of Venezuela, PSUV. In spite of what many of my socialist friends think, I don’t think that taking a stand on the situation is about being with the left or the right, the context is very different: it’s about respecting human rights while living in democracy. In a real democracy, people, the citizens should be listened to (regardless of the color of their skin, their political opinion or their social status) and the Government has the mandate to protect these rights and create spaces for dialogue when there’s so much structural violence. I don’t think these last governments (Maduro’s and Chávez’) have provided enough opportunities for reconciliation. Instead, there’s yet more division between “us” and “them”. Today there’s a call for unity, but I wonder how will that happen after so many years of this blaming game. Venezuela needs to heal its past and a dialogue process can’t be imposed. For there to be reconciliation, relationships have to be rebuilt and political consensus is needed. But this cannot happen in an authoritarian state that attacks its citizens and does not guarantee their human rights. Only by combining truth, justice and accountability will the country transition into a peaceful future. My mind has been in Venezuela the last days, as violence has exploded on the streets. Things have been getting worse and it makes me sad to see fundamental freedoms deteriorate like that, and young people being deprived of any hope for a better future. But it’s not only Venezuela: Kiev-Ukraine, Bangkok-Thailand, Bangui-Central African Republic, Malakal-South Sudan…there’s chaos all around and I wonder how realistic is to think that peacebuilding can help. Where are we going to find the strength to deal with so many atrocities and how do we change these behaviors? Will we have the right tools after completing this program to engage in meaningful dialogues that can promote the changes needed? When will the right time be for us to work on this? When will the parties on these conflicts be ready and allow the creation of the necessary space for dialogue to exist? It’s morally devastating and quite depressing. Then, today in class Margaret shared this – the timing was brilliant. It has been a hard week trying to deal with so many conflicts here and there, and I needed something to regain hope. It’s a combination of maybe being on the verge of burnout and realizing that we have been away from home for 45 days already plus there’s still so much to learn and to do before we go back… So this came to me like a bouquet of fresh flowers. THANKS, my friend! It is a decision to enter into the fray no matter how illogical and crazy things are. Even as our friends, family and common sense recommend that we stay away. including bad people who don’t seem worth struggling for. We did not plan to live in such a crazed world. aggression and insanity we now encounter daily. the world was portrayed as rational, predictable, logical. Ever-present insanity, illogic, injustice, illusion. This is just the way it is and will continue to be. We can’t restore sanity to the world, but we can still remain sane and available. We can still aspire to be of service wherever need summons us. We can still focus our energy on working for good people and good causes. It is never too late to be brave. Today I was invited to speak at Khun O’s (my Rotary Counselor ‘Penny’) club, to share with their members more about my work at LAFLA and the Fellowship program. It’s the second time I attend a Rotary meeting in a language that I don’t speak (in Los Angeles I got to attend the meeting of the Iranian-American Rotary Club near Beverly Hills -very interesting), but again I was lucky to get one of the members translate to me some of the interesting presentations that community members were doing about the needs of one of the local schools and potential projects in which the Club could get involved. As I introduced myself, some things came to my mind: I’ve been working with survivors of violent conflict for the past decade and that even when with years, I get to see the transformation of my clients as they integrate to the US, I know how much they long going back home and how often their countries are no longer safe. My hope is that as Rotary builds this amazing network of peacebuilders, more of us can contribute make the world a better and safer place (as cliché as it can sound). It’s not enough to have services for them and make them feel comfortable in a new country, it’s important to address the roots of the problem, the reason why they had to escape, hoping that one day they can return safely and give back. This week went by so quickly! We had a day off on Monday, after returning from Mae Sot and from Tuesday to Thursday we immersed ourselves in a communications workshop. One of my favorite topics -you guessed right! Alex, who graduated from the Fellowship’s Class XIV taught it and he was great. Coincidentally I’ve been meaning to meet him for a while as we’re both UNAOC Fellows, so this was a unique opportunity to connect. One interesting realization from this workshop was how -sadly- in most organizations there’s little cooperation between Operations, Communications and Fundraising. We closed the workshop by presenting our communication interventions, where we explained target, topic and frame and then showed the class our interview and press releases and received feedback from the group. The best part was working on a real case for a campaign on behalf of tea workers in Assam, India. Read more about what’s going on in that side of the world through this report from Columbia Law School’s Human Rights Institute. My team mates during the communications campaign exercise. Had we have more time allocated for this workshop I would have liked to discuss with other fellows the communication campaigns in which their countries have engaged in and discuss more issues of public diplomacy -a tool that in some parts of the world is not taken for granted. On the social front… This week we had a big social event with the Rotary Counselors at the Goethe Institut. It was a good opportunity to exchange more with my counselor Penny and others -a group of very committed Rotarians- who made us laugh, sing karaoke with us and talk lots over good food. A couple of new places some of us explored this week in Bangkok were: Condoms and Cabbages on Thursday (nice setting, food was alright and pricey) and DaMamma’s Pizza on Sunday night (finally, some decent pizza, definitely check it out). 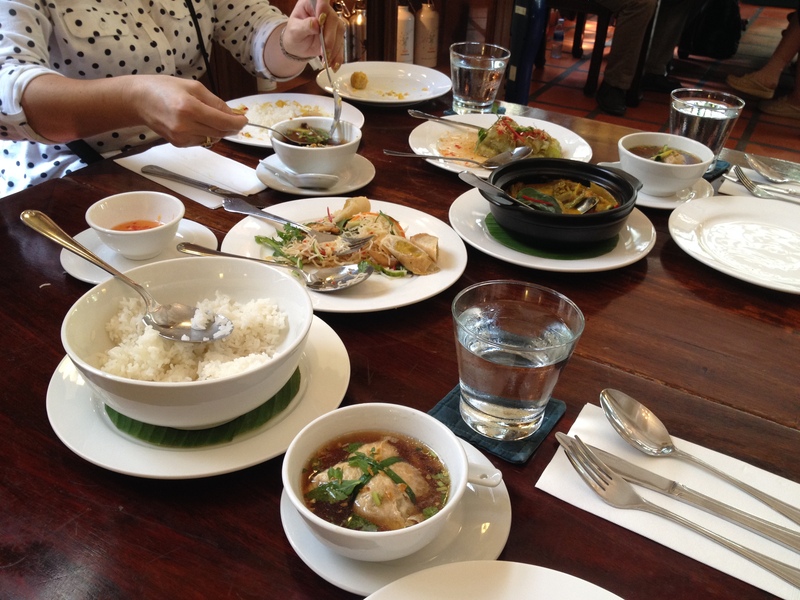 After a busy week in Mae Sot, we arrived in Bangkok on Friday night exhausted but still savoring the Burmese flavors and memories of all the good people we were able to meet up there. Even when I was sad to leave behind the fresh air and the town’s lovely landscapes, I had a great reunion on the horizon: my friend and ex-LAFLA colleague Gloria was spending the weekend with me, after almost two years since she left Los Angeles for Hong Kong. 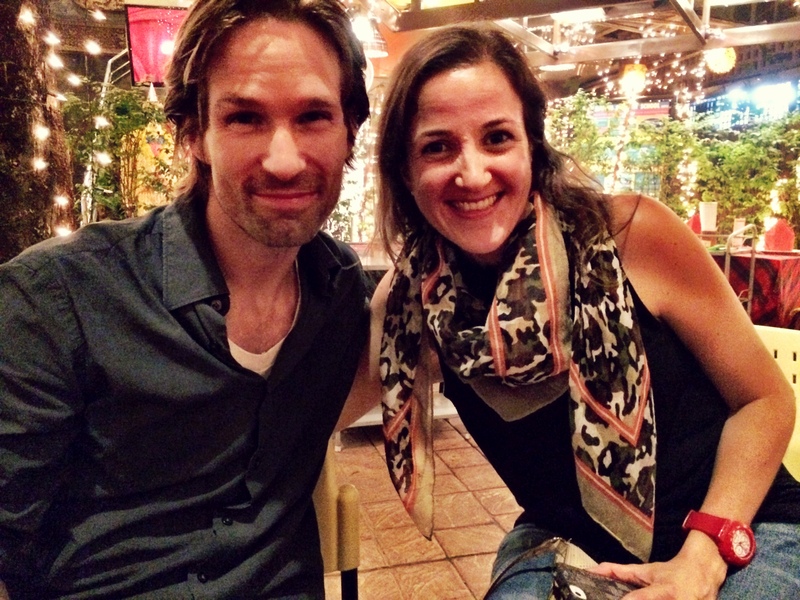 It was great to catch up, do some tourism together and speak only Spanish for three full days! ¡Viva! Saturday we walked around town: had some street food and explored Bangkok by foot as long as we could (though we had to take a taxi from National Stadium to the temples and ended up getting stuck in heavy traffic). 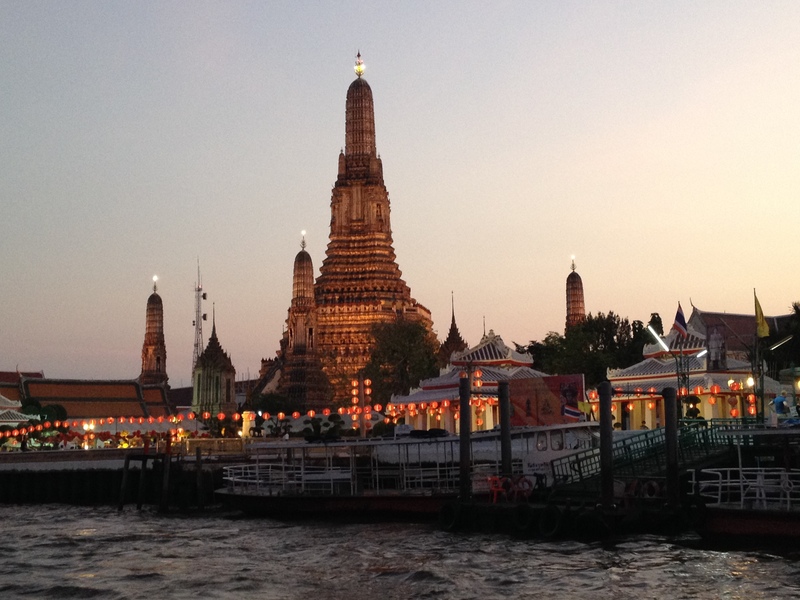 We visited Wat Pho (the Reclining Buddha temple), the Grand Palace and we saw the sunset in Wat Arun (the Temple of Dawn) from the RuaDang (the pier). 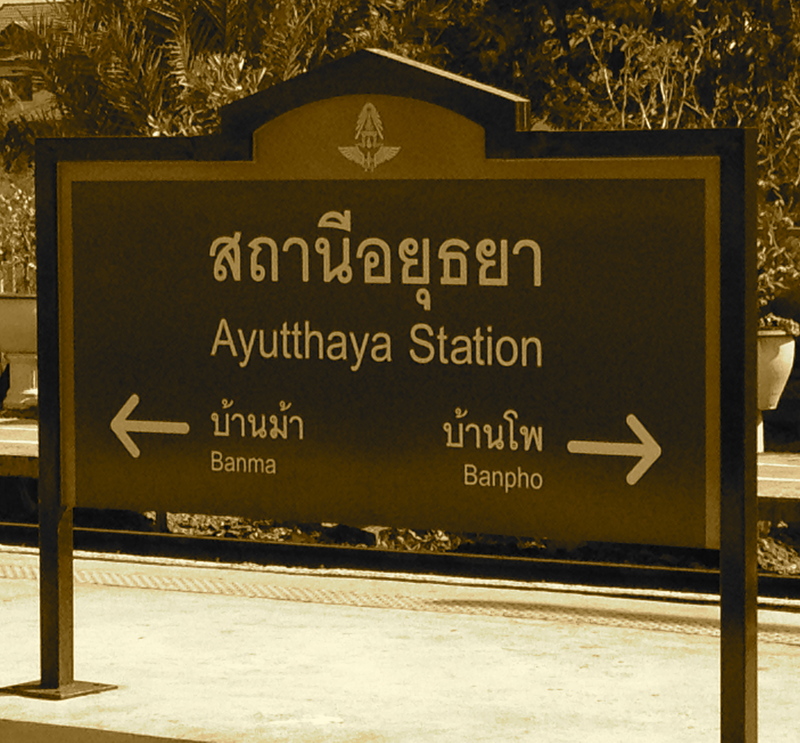 Sunday took the train to Ayutthaya, a couple of hours out of Bangkok. We got there early in the morning and -as recommended by Oy- we rented a couple of bicycles and crossed the river to explore the historical landmarks. 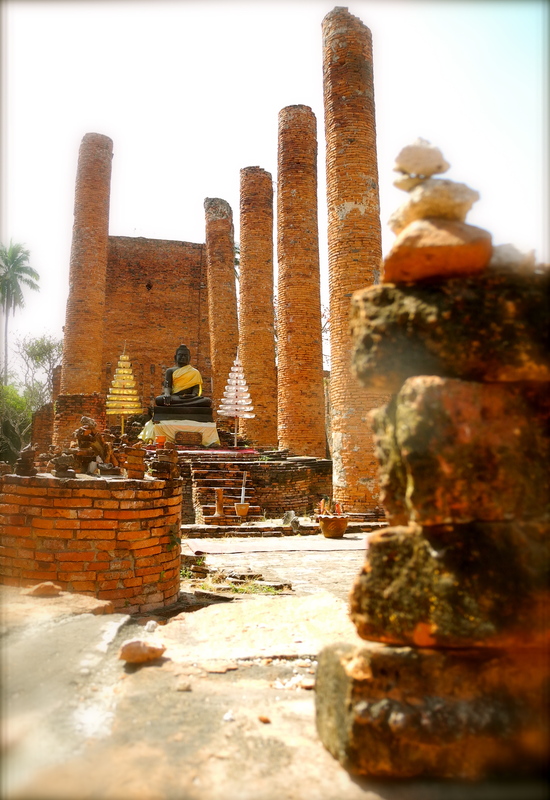 This was the second capital of Siam and back in the day it was a center of commerce. 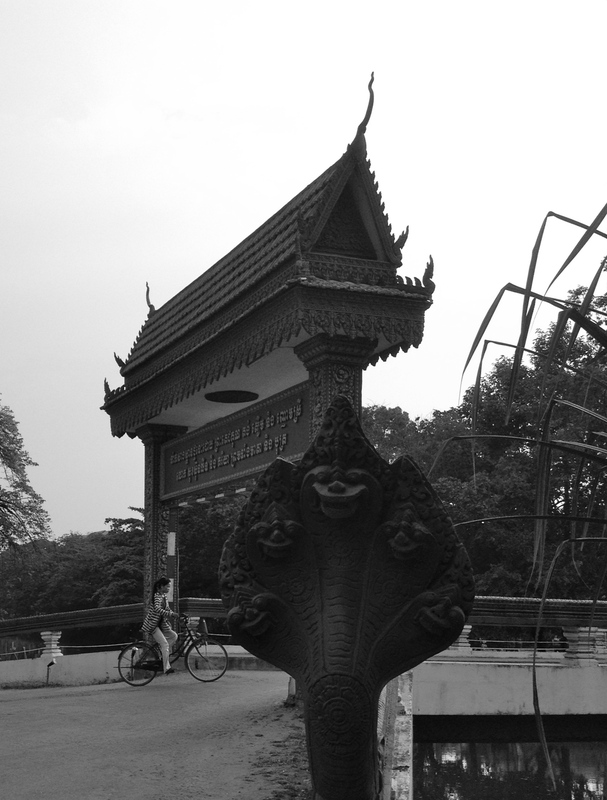 It was lovely to ride around the different temples, get some sun, visit the market and mingle with elephants. After a fun day out of the city, we headed back to Bangkok in the afternoon, and after many delays, hopped on the regular train (no express available) tired but ready to catch up with some reading. Riding this old, rusty train suddenly I felt like a visitor from the future as I pulled my iPad out of the bag to take a look at this week’s class materials. Here I am, learning about communication for development and remembering how many have been excluded of the participatory process…sad. This day trip was spectacular, highly recommended. So what better way to remember the weekend that with some photographic memories? 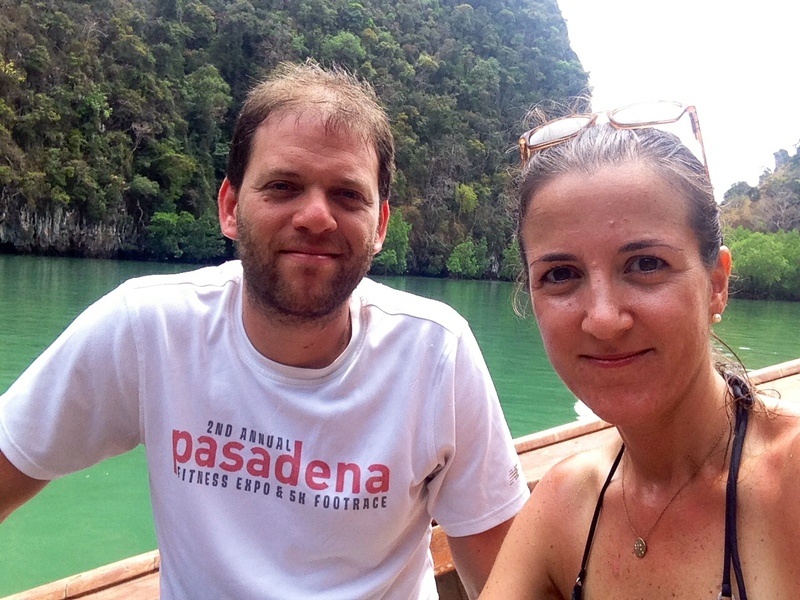 Thanks Glori for the lovely visit and hope to see you soon! Last chapter of my T… on Enough?